Although the initial dialog in Windows Update suggested this download could run anywhere from 44 to 533.1 megabytes, this machine only needed a 62.5 MB download, or less than a tenth ofsome of Apple’s Mac OS X updates. Windows Update took about 30 minutes to install SP1, after which the computer spent another 24 minutes in a post-reboot “configuring” session. And then I struggled in vain to find any difference from this update. Not all Service Packs incorporate major changes–Windows XP’s SP3 was remarkable for its lack of headline features after the desperately-needed security upgrades brought by SP2–but Win 7 SP1 may be Microsoft’s least consequential Service Pack ever. For most home users, its primary utility is ensuring that they’re current with all of Microsoft’s prior patches and fixes, including some that were not automatically distributed. That’s not a bad thing. An operating system shouldn’t need major corrections a year and a half after its debut. SP1 also includes new improvements to features and services in Windows 7, such as improved reliability when connecting to HDMI audio devices, printing using the XPS Viewer, and restoring previous folders in Windows Explorer after restarting. But the “Service Pack 1 resources” page linked to from there did not have the promised release notes that would provide a full description of this update. Instead, it reported that “This content is no longer available” and suggested visiting a third support page. The links under that page’s “Key Resources” heading promised a full report but instead directed me to a fourth tech-support page, on which I could download a series of documents about the update. Not regular pages I could view in my browser, or even PDFs readable with a plugin, but Microsoft Office documents. One, a Microsoft Word file called “Notable Changes in Windows 7 and Windows Server 2008 R2 Service Pack 1,” revealed that SP1’s consumer-relevant updates didn’t extend beyond those listed on the first, “What’s Included” page. (To spare you the download, I’ve reproduced those portions after the jump.) 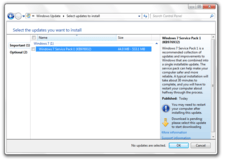 Another, an Excel spreadsheet named “Hotfixes and Security Updates included in Windows 7 and Windows Server 2008 R2 Service Pack 1,” itemized the 755 “hotfix” patches (not all of which you would have received through Windows Update) and 41 security fixes (which you should have gotten already) rolled into SP1. Some of those earlier updates, however, only affect Windows Server 2008, Win 7’s younger, non-consumer-oriented sibling. So, yes, Win 7 SP1 is a big deal. It’s just apparently not big enough for Microsoft to document properly. I hope that your Win 7 SP1 install has been as drama-free as mine, but if it wasn’t, I’m sure I’ll read about it in the comments. How has that upgrade gone for you?